Due to the way the case adheres to the device, one may experience some initial difficulty with using the screen along the edges of the case, but you get used to it quickly. Makes changing batteries a bit more tedious and difficult since the case would have to be dis-assembled/reassembled after changing batteries. 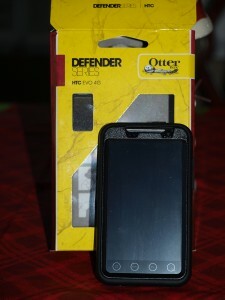 The Otterbox Defender, sold for $49.95 at www.otterbox.com, comes in three pieces. The middle layer is a two-piece set of an incredibly durable polycarbonate that acts as a hard shell around your phone. Simply lay your phone in the bottom-half of the shell and snap the top piece on with the six contact points across the case. I did find that snapping these pieces together was difficult, and caution should be taken when assembling the case for the first time. In the past, I’ve had a hard time finding a snap-together case that would actually withstand a drop from the waist down. Most of my previous cases would come apart in such a drop, or end up scratching my EVO from the contact of banging against it! Thankfully, the Defender series case is not one of those cases. It snaps on and stays put as it was designed! Also, this middle layer has an integrated screen protector that makes the Defender ideal for any typical environment. No worries stashing the phone in your purse or bag! The third layer of the case a shock-absorbing silicone that fits around the edges of the polycarbonate layer. It takes some time to fit the silicone around all the edges of the case, but once you have it installed, it really does give the true feeling of durability as all the parts come together. I have to admit that I was not sure if I preferred this case until I installed this layer, but I felt reassured as I took a look at the completed case in detail. I’ve used a variety of cases on this fragile phone before, but no other case made it seem so safe and protected like the Otterbox Defender. Though it gives all 360 degrees of protection, you can still open and close the rubber sockets to allow access to the headphone jack, charging port, and other vulnerable, yet necessary parts of the device to use even when protected. With the case installed, I noticed that the phone felt a little heavier and thicker in the hand. I would not really consider this to be a negative aspect, as it does make the phone seem to “stick” to your hand somewhat. Therefore, I consider this to be a neutral point. After utilizing the case for a week, I can attest that the amount of weight and size that was added does not bother me as much as I had first thought. Another neutral point for me is the way the case outlines the screen of the phone. It is more invasive on the screen than my gel case was, but the more I used the case during my day-to-day tasks, the less problematic this became. The only thing that the case does is to cause accessing my status bar a little more tedious. However, if I drop my phone face down it will keep my screen further away from the point of impact. I would much rather take the time to become accustomed to a new way to access my status bar, because if your phone breaks in a fall, you are not going to have a working status bar anyway. Some minor cons with this case are as follows: If you have a spare battery that you carry around with you, instead of just charging your phone, you will have to fully disassemble the case and reassemble it every time you switch the battery. When using the charging port, you might find that sometimes it is required to refit the silicone layer around the bottom portion of the screen. Thankfully, this is a minor point, as it is really not that time-consuming to re-assemble. It takes nothing more than rubbing the layer up toward the screen with your thumb. The case does come with a swivel belt clip that allows you to the flexibility to have your screen facing in or out from your belt. The phone feels very secure in the case, and the case itself does not add much weight. So for those of you that like to use a belt clip, this is a nice one. When I started using this case (in place of my $20 gel case), I was skeptical on whether I would be able to find a way to justify spending $49.95 on a case such as this for my phone. I can honestly say that after using this Defender case, having suffered through with the old case which would not even let me press buttons with ease, I think the old adage “sometimes you get what you pay for” applies here. It is my opinion that this case is worthy of the added investment. After all, as valuable as your phone is, you want to make sure that your investment is well-protected. The Defender Series case is without a doubt the best case I have utilized to date. I enjoy the freedom it grants me to enjoy my phone without having to worry about the daily bumps, scrapes and scratches incurred in day-to-day use with such a fragile device, as well as the added insurance against the less-common harder impacts such as drops. Would I recommend it to a friend? Yes! In fact, I already have.